Maybe you don't have the cash handy. Or you may want to help, but worry that a handout of cash alone isn't the best way, especially if the person is struggling with addiction. For many of us, it's a quandary, especially during the holiday season, when we're mindful of those in need. Arbor Terrace Johns Creek came up with an ingenious solution, as part of its "What Could You Do with $1?" project: care kits for the homeless. The funds were used to buy items like soap, razors, feminine hygiene items, lotion, socks, toothbrushes and toothpaste, as well as snacks like Vienna sausage, candy, juice boxes, granola bars and oranges. Members of the community's club knitted and crocheted washcloths to add; one resident donated 24 one dollar bills, one for each kit. 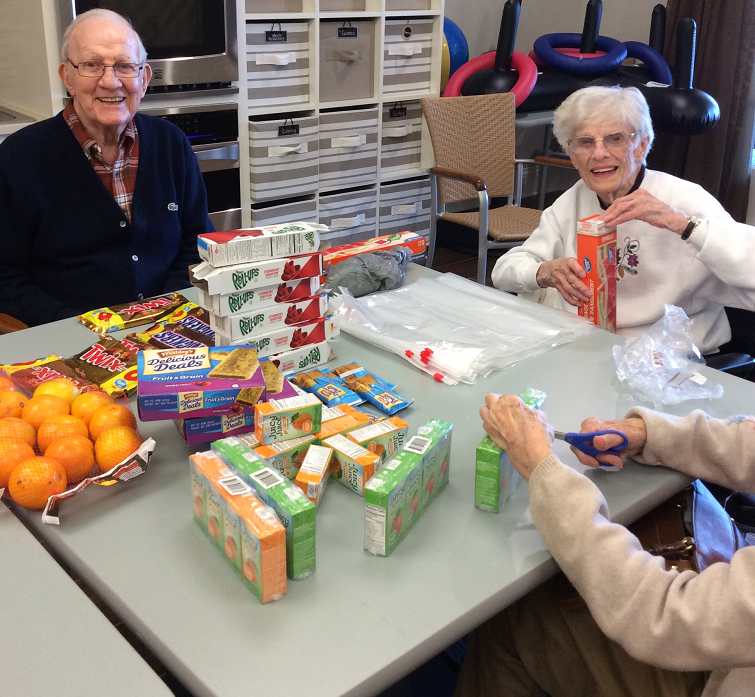 Residents and staff teamed together to handle the planning, shopping, and packing, culminating with a "packing party" on December 9, in which residents sorted the items into 24 one-gallon Ziploc bags. Staff members will stash the kits in their cars and, in the days ahead, will pass them out when they see homeless folks asking for help. "The idea is that you aren't fumbling through your wallet to scrape up some cash or change, or having to pass by someone you'd like to help in a meaningful way," said Becky Wagner, Engagement Director at Arbor Terrace Johns Creek. "With the kits, you have something to give that person that will really help." The community made a few dozen care kits to get started but hopes to involve the broader community and continue to make and distribute the kits on an ongoing basis in 2017.